You can also able to restart your android phone restart in safe mode. When you restart your android phone in safe mode, then all third party applications are disabled. Your phone is like that you switch on this phone first time without resetting your phone. You can also restore all apps when you reboot your phone again. 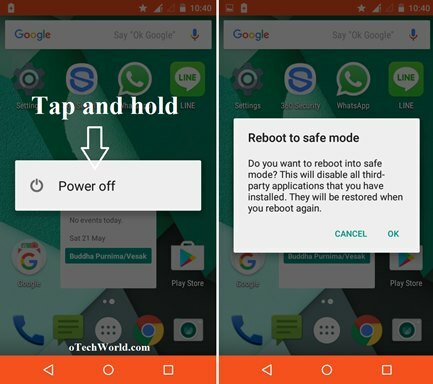 Read this post to know Restart Android phone In Safe Mode. If your phone is not working properly and you want to see how your phone operating after factory reset without reset your phone. Press and hold power button. You’ll see Power off option. Tap and hold on Power off option. Now you’ll see Reboot to safe mode option and press ok.
After the restart, you will see only pre-installed applications. All google applications are available after the restart. If you want to exit from safe mode, simply Power off your android phone and then power on your phone. After that, all applications will be restored. But you log out from all third party applications like Whatsapp, Twitter, Facebook etc. And You need to log in again these applications. If you found this information is useful then share it.